Star Trek Online is set in the years 2409/2410, thirty years after the events of Star Trek: Nemesis. The alliance between the United Federation of Planets and the Klingon Empire has collapsed, and they are again at war. The Romulan Star Empire continues to deal with the fallout of the loss of their homeworld twenty-two years earlier (as shown in J. J. Abrams' Star Trek reboot), while the Dominion rebuilds its forces. The Borg Collective has re-emerged as a major threat. In later expansions the Vaadwaur, the Iconians, the Na'Kuhl, the Krenim, the Terran Empire, the Voth, Species 8472, the Tzenkethi and the Hur'q are also introduced as adversaries. In Star Trek Online, each player acts as the captain of their own ship. Players are able to play as a starship, controlling the ship's engineering, tactical, and science systems by keyboard/mouse or using an on-screen console. Players can also "beam down" and move around as a player character in various settings with access to weapons and specific support and combat skills relating to their own characters' classes. The two combat systems are intertwined throughout the game: away-team missions feature fast-paced "run-and-gun" combat, while space combat stresses the long-term tactical aspect of combat between capital ships. Both are offered in concert with the Star Trek storyline and emphasize ship positioning to efficiently utilize shields during space combat, as well as the player's away team's positioning in consideration of flanking damage and finding various weaknesses to exploit during ground combat. Other aspects of the game include crafting; which in its current form involves using duty-officers (junior crew members) to make items, depending on the level of the school (category- such as science, beams, etc) chosen. To raise the level of the school being researched, it is necessary to perform a research project using a crafting material. Unlike in some other MMO's, crafting is a "set-and-forget" procedure. The player will set up the project, click a button and after a specified time the task will be completed, rather than spending time actually performing the crafting. Duty Officers can also be sent on assignments which also follow the set and forget methoodology, and are not available during the time the assignments are in progress. Characters of level 52 and higher can send any ships they have, or have had on admiralty missions, similar to duty officer assignments, but these do not use duty officers to perform them. Again, the mission is selected and a certain amount of specified time passes until the player is told it is complete, at which time they will be informed whether it was successful. On September 1, 2011, Cryptic Studios announced that Star Trek Online would switch to free-to-play, but without full access to all the items. Later, it was announced that free-to-play would be starting Tuesday January 17, 2012. F2P for existing, but cancelled, customers began Thursday January 5. Cryptic Studios officially announced the development of Star Trek Online on July 28, 2008, as a countdown timer on Cryptic's web site reached zero and the new official site was launched. A letter was sent out from Jack Emmert, the game's online producer, detailing some aspects of Cryptic's approach. Console versions were announced several months before the release, with no specific console platform specified, but Cryptic announced that all console versions of their games are on indefinite hold due to difficulties "on the business side of things," largely referring to the fees assessed by Microsoft for their Xbox Gold premium online gaming service and the difficulty in asking a player to pay both that and the Cryptic subscription fee to play a single game. Console support, for both Microsoft Xbox One and Sony PlayStation 4 was made available in September 2016. The initial release was in North American regions, but will be rolled out to additional regions in the Americas and Europe. Star Trek Online's closed beta test officially began when it was announced on October 22, 2009. Cryptic Studios offered guaranteed beta access to users who bought 6-month and lifetime subscriptions to Champions Online. However, the offer did not explicitly state how early in the beta process the access would be granted. Some pre-order packages included access to the 'open beta' running from January 12––26, 2010. Legacy of Romulus is Star Trek Online's first expansion pack, announced on March 21, 2013. A third playable faction, the Romulan Republic, was added, with the choice of Romulans or Remans (at present) as player characters, as they battle a mysterious new enemy and try to discover the secrets behind the destruction of Romulus two decades earlier. Denise Crosby, who reprised her role of Tasha Yar during STO's third anniversary, reprised her role of Tasha's daughter Sela, the Romulan Empress. Also featured is a complete leveling experience from level 1 to 50 (the current level cap) for the Romulans and for the Klingons, a Tholian reputation faction, a customizable UI, and an overhauled "traits" system. Legacy of Romulus was released on May 21, 2013, between the Season 7 and Season 8 releases. Delta Rising is Star Trek Online's second expansion, announced at the Official Star Trek Convention in Las Vegas on August 2, 2014. Cryptic had hinted of a new expansion in December 2013, with a release "late in 2014". The expansion is set in the Delta Quadrant, the main setting of Star Trek: Voyager. Tim Russ reprised his role as Admiral Tuvok (who appeared in two feature episodes in Season 9), and he was joined by Garrett Wang as Captain Harry Kim of the USS Rhode Island (established in the Voyager series finale "Endgame"), Jeri Ryan as Seven of Nine, Robert Picardo as the Doctor, and Ethan Phillips as Neelix. Lead Designer Al Rivera said that "several" Voyager cast members would appear in Delta Rising. The level cap was raised from 50 to 60, adding two new ranks for each faction: Admiral and Fleet Admiral for the Federation and the Romulan Republic, and General and Dahar Master for the Klingons. Several Delta Quadrant races that appeared in Voyager will also were included in the new content, as well as a new tier of ships for the higher levels, and a Delta Reputation tree for players to progress through. Delta Rising was released on October 14, 2014. Agents of Yesterday is Star Trek Online's third expansion, announced on May 5, 2016, as the game's contribution to the 50th anniversary of Star Trek. The expansion allows for the creation of Starfleet player characters from the era of the original series who become involved in an ongoing "Temporal Cold War" (a storyline that was introduced in Enterprise, and brought into STO with the "Future Proof" missions in Season 11) with the Na'kuhl species. Matt Winston reprised his role as Daniels, the temporal agent who fought alongside Captain Jonathan Archer to stop the Na'kuhl in several episodes of Enterprise. He was also joined by Walter Koenig, reprising his role as Pavel Chekov, and Chris Doohan as Montgomery Scott, filling in for his late father, James Doohan. The expansion also intersects with the alternate timeline from the reboot series begun in 2009 by J. J. Abrams; Joseph Gatt reprises his role as the cyborg science officer 0718, who appeared in Star Trek Into Darkness. Agents of Yesterday was released on July 6, 2016. Victory is Life is Star Trek Online's fourth expansion, announced on March 21, 2018, as the game's contribution to the 25th anniversary of Star Trek: Deep Space Nine. The expansion opens up the Gamma Quadrant, accessible by the Bajoran wormhole, and also adds the Dominion as a playable faction, with the ability to create Jem'Hadar characters. The Cardassians can also be unlocked for the Starfleet and Klingon Defense Force factions in the in-game store. Several DS9 actors reprise their roles in the expansion, including René Auberjonois (Odo), Nana Visitor (Kira Nerys), Alexander Siddig (Dr. Julian Bashir), Armin Shimerman (Quark), Max Grodénchik (Rom), Chase Masterson (Leeta), Aron Eisenberg (Nog), Andrew Robinson (Elim Garak), J. G. Hertzler (Martok), Jeffrey Combs (Weyoun and Brunt), Salome Jens (the Female Changeling), and Bumper Robinson (Dukan'Rex, the Jem'Hadar youth who appeared in DS9's third season episode "The Abandoned"). Victory is Life was released on June 5, 2018. Cryptic Studios partnered with several retailers for distribution of pre-order copies. Each retailer had a version with unique and exclusive content, such as a Borg Bridge Officer (Amazon), a classic Constitution-class starship (Gamestop), Sniper Rifle (Target), Chromodynamic armor (Steam), 500 bonus skill points (WalMart), Neodymium deflector dish (SyFy), or a Tribble/Targ pet (Best Buy). All versions of the game came with access to the Open Beta and Head Start launch date. In addition, the code for a "Wrath of Khan" Admiral's uniform is included in the DVD release of "The Best of Star Trek: The Next Generation Volume 2" and the Blu-ray release of "Star Trek: The Original Series – Season 3." Upon launch, Star Trek Online was owned by Cryptic Studios and published by Atari Interactive, along with sister title Champions Online. On May 17, 2011, Atari indicating they no longer wanted to pursue MMORPG gaming, and that they planned to sell Cryptic Studios off. Later in that same month, Perfect World Entertainment purchased Cryptic Studios for $50.3 million and continued their operations. Star Trek Online has received mixed reviews, garnering a 66 on Metacritic. GameSpot praised the game's space combat as entertaining, but found the other aspects of the game to be "bland and shallow". MMOify's reviewer reviewed the game favorably but criticized many aspects of gameplay, including "poor voice acting" and repetitive quests. An IGN reviewer described the game experience as feeling like "two games" which did not mesh together well, and although visually it was "quite a gorgeous game", found much of the gameplay to be repetitive in nature. ^ Matulef, Jeffrey, 12/05/2016, "Star Trek Online boldly goes to PS4 and Xbox One this autumn" (http://www.eurogamer.net/articles/2016-05-12-star-trek-online-boldly-goes-to-ps4-and-xbox-one-this-autumn) Eurogamer. ^ a b c Welsh, Oli (November 6, 2009). "Star Trek Online out in February". EuroGamer. Retrieved 2009-11-06. ^ "STO Mac is Officially Live!". STO – Arc Games. March 11, 2014. Archived from the original on March 11, 2014. Retrieved 2014-03-11. ^ "Star Trek Online: FAQ – When does the game take place?". Cryptic Studios. 2009-04-27. ^ "Star Trek Online". Star Trek Online. Retrieved 2010-02-20. ^ a b "STO Free-To-Play". Cryptic Studios. Retrieved 2011-09-16. ^ "Mac Closure Notice". 2016-02-04. Retrieved 2017-05-08. ^ a b Paget, Mat (September 6, 2016). "PS4 and Xbox One Add Another Free MMO as Star Trek Online Launches". GameSpot. Retrieved September 7, 2016. ^ Star Trek Online free to play features detailed, posted by Tom Senior, pcgamer.com, September 7, 2011. ^ Star Trek Online: Free-to-Play Officially Live!, posted on browsergamez.com, January 18, 2012. 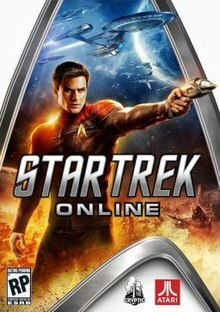 ^ Star Trek Online: Some Players Get Early Access for Free-to-Play, posted on browsergamez.com, January 5, 2012. ^ Cryptic Studios Confirmed For Star Trek Online, Gamasutra news, July 28, 2008. ^ producer's letter Archived 2008-12-04 at the Wayback Machine, accessed 7/29/2008. ^ Magrino, Tom. "Star Trek Online for consoles moved to 'back burner'" Gamespot.com. Posted and Retrieved April 7th, 2010. ^ "Star Trek Online Available on Xbox One and PlayStation®4! | Star Trek Online". Retrieved 2016-09-15. ^ "Closed Beta, Here We Come!". Cryptic Studios. 2009-10-22. ^ "Champions Online Special Offer". Cryptic Studios. 2009-08-04. ^ a b c d "Star Trek Online: Legacy of Romulus". Perfect World Entertainment. 2013-03-21. Retrieved 2013-03-21. ^ "Star Trek Online's Legacy of Romulus expansion coming May 21 [Updated]". Massively.joystiq.com. 2013-03-21. Retrieved 2013-03-21. ^ Rumour mill working over time or is it for real – Star Trek Online – Post by Cryptic Studios Team member "CrypticQuack"
^ a b "STLV Star Trek Online: Delta Rising Announcement" – via YouTube. ^ "New Star Trek Online Expansion Coming in 2014". www.tentonhammer.com. ^ "The Voyager Crew Returns! | Star Trek Online". www.arcgames.com. ^ "Delta Rising Official Launch Date | Star Trek Online". www.arcgames.com. ^ "Star Trek Online: Agents of Yesterday Announcement | Star Trek Online". www.arcgames.com. ^ "Star Trek Online: Bringing 0718 to STO | Star Trek Online". www.arcgames.com. ^ "Agents of Yesterday Now Available! | Star Trek Online". www.arcgames.com. ^ "Victory Is Life - Our Fourth Expansion, Coming June 2018! | Star Trek Online". www.arcgames.com. ^ Wallace, Aaron. "The Best of "Star Trek: The Next Generation" Volume 2 DVD Review". UltimateDisney.com. Retrieved 2010-01-08. ^ Matt Daniel (May 17, 2011). "Atari: Cryptic Studios a 'discontinued operation' [Updated]". Massively (Joystiq). Retrieved 17 October 2012. ^ "Perfect World buys Cryptic". IGN. May 2011. Retrieved 17 October 2012. ^ a b "Star Trek Online Reviews". Metacritic. Retrieved 2010-03-11. ^ a b VanOrd, Kevin (2010-02-17). "Star Trek Online Review". GameSpot. Retrieved 2010-03-11. ^ a b Kolan, Nick (2010-02-17). "Star Trek Online Review". IGN. Retrieved 2010-03-11. ^ Manolache, Andrei (2014-03-07). "Star Trek Online Review". Retrieved 2014-06-05.